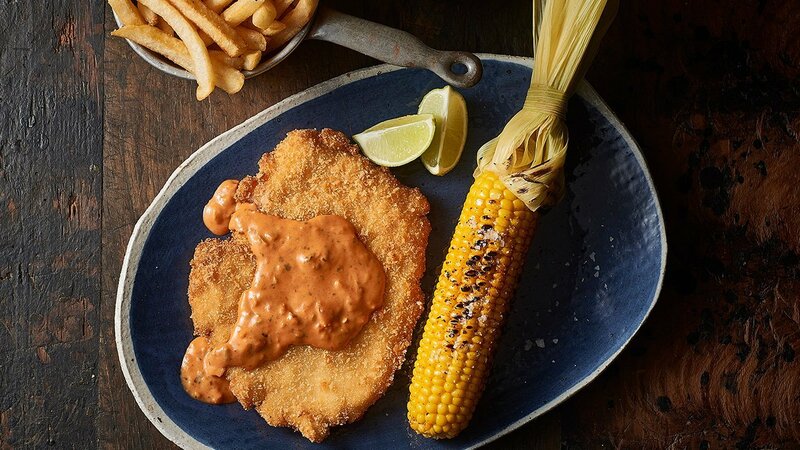 A crispy chicken favourite, accompanied by a Mexican inspired cream sauce. New, exciting and easy to do!! Crumb chicken breast in flour, eggs and breadcrumbs and set aside ready to fry. Combine KNORR Mexican Chunky Salsa Mild GF, KNORR Concentrated Liquid Stock, KNORR Professional Mixed Chilli Puree, KNORR Professional Paprika Puree and cream in a pot and heat ready to use. Charred corn, lime wedges and chips.